Posted Thursday, January 26th, 2012 by Robyn Warner. Some printers have more than one output tray. This error indicates that the wrong paper path is selected, or the selected path has no paper. There is a paper jam in the machine. Open any access panels and check for jammed paper, then slowly remove it. 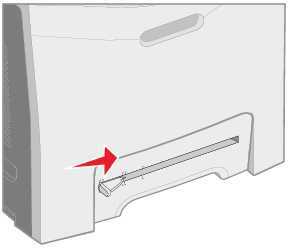 If there is not paper jam, check for small bits of paper or debris stuck near the sensors, as this may also trigger the error message. 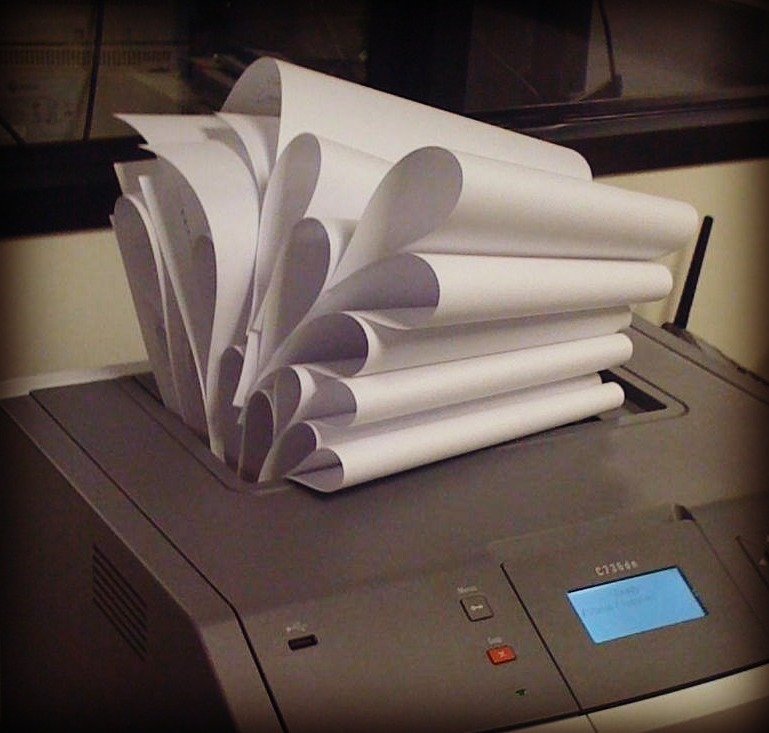 For more detailed instructions for clearing a paper jam, visit this IBM page. Check the paper tray. If there is paper already loaded, try unloading the paper and reinserting it to make sure it is being recognized. If you have multiple trays, the printer may be set to an alternate tray that is currently empty. Make sure the printer is set to the manual feed slot before inserting paper. 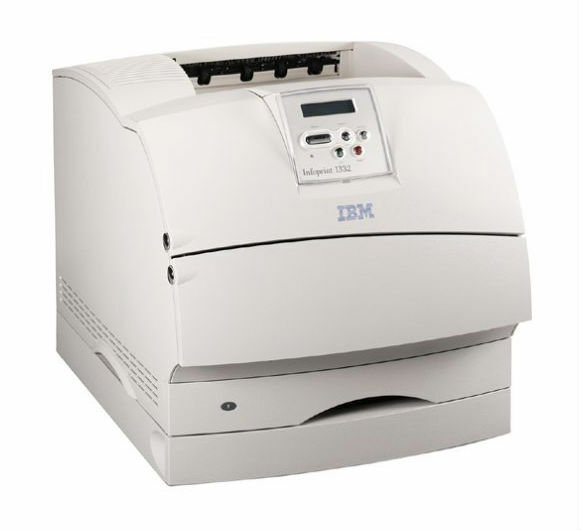 An IBM Infoprint 1332 laser printer with no MFP attachment. Posted Friday, January 13th, 2012 by Robyn Warner. 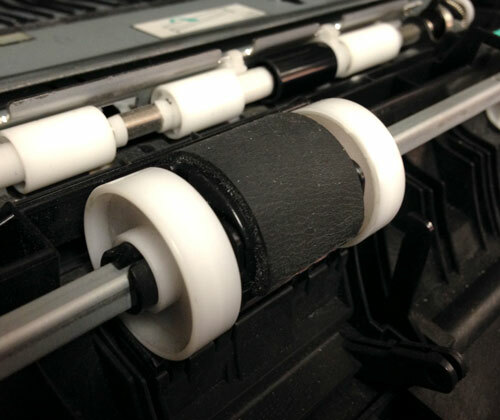 A printer’s rollers play an important part in the printing process. They are responsible for moving the paper through the printer at the correct speed. If you find that you are consistently having problems with paper jams, misfeeds, or marks on your prints, you may want to inspect and even replace the rollers. Rollers that are damaged or worn down will not feed properly. Posted Thursday, January 12th, 2012 by Robyn Warner. Many printers, especially laser models, include multiple paper paths for printing. Which paper path is used will often depend on factors such as the type and thickness of media being used. Card stock media should generally be printed with the straightest path possible, to avoid bending it. Posted Friday, January 6th, 2012 by Robyn Warner. Laser printer owners generally don’t have to worry much about maintenance and upkeep because the reliability and durability of these machines gets better with each year of production. For the most part, users will only need to be able to swap out expired toner cartridges. It may seem like a simple task to some, but for people who have never done it, it can be intimidating. This is a simple tutorial for inexperienced users trying to get through the process and who need a little guidance. 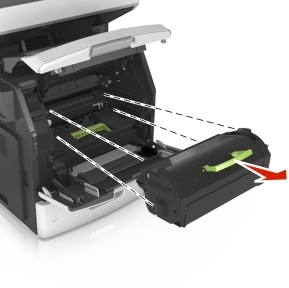 The print heads of an inkjet printer are responsible for transferring ink from the cartridge to the page. The combination of multiple print heads for different colors means that each needs to line up properly to create sharp image or text. If they heads are out of alignment with each other, you could end up with skewed text, fuzzy output, and a number of other issues. 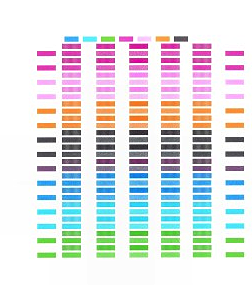 Test patterns like this one can help you align your print heads.